Stefani and Shelton were seen kissing and being affection inside the Gonzalez restaurant in Shelton’s hometown. The couple later sends out a Christmas message. No one likes to see the person dragged into the light like this, but in this case there’s a sense of relief people now know what she was dealing with. The divorce is final, and she’s the one who stood the most to lose, so it doesn’t make any sense. After a lot of the BS stories about Gavin still wearing his ring, she and everyone who is close to her are relieved that truth has seen the light of day. The iPad was linked to Gavin’s phone. One of the other nannies discovered the exchange and told Gwen. [The admission] completely devastated her. She was mortified, livid, and embarrassed. Stefani files for divorce from Rossdale, citing irreconcilable differences as the reason for the split. Rossdale is said to have filed his response at the same time, and both parties are allegedly seeking joint custody of their children. Stefani is not planning on providing Gavin with spousal support. NBC announces coaches for season nine of The Voice. Aguilera is replaced by Stefani, who sat in for Aguilera during maternity leave. Stefani appears on the cover of Cosmopolitan. Stefani discusses her music career. Stefani and Levine perform My Heart Is Open during the Grammy Awards show. Stefani wins People Magazine Award for style icon of the year. Shelton, Levine, Stefani and Williams perform Have Yourself A Merry Little Christmas during the season finale of The Voice. The Voice 2014 – Season 7 Voice Coaches: "Have Yourself a Merry Little Christmas"
Stefani and Williams perform Spark the Fire on The Voice from her upcoming album. The Voice 2014 – Gwen Stefani and Pharrell: "Spark the Fire"
He’s like, ‘I’ve got to play you this. I have to play you this. And so he plays me this song, and it’s like magic. All it was was a beat and he was singing this melody on top and I just knew, that’s it. That night, after shooting all day, we went in the studio all night long, stayed up till four in the morning, came back, got on set and then didn’t finish. The artist releases, Baby Don’t Lie, from her yet to be titled album, The music video is co-directed by Muller. Seacrest interviews Stefani during On Air With Ryan Seacrest about her collaboration with Pharrell Williams. I feel like this whole thing is not about singles, its about the whole project. Rossdale and Stefani work together on The Voice, with Stefani co-hosting and Rossdale helping to mentor aspiring singers. We’ve never done anything like this together. Fallon, Shelton and Stefani battle in a lip sync-off with songs such as Endless Love and Burn. Stefanie and Shelton perform a Lip Sync Battle on The Tonight Show Starring Jimmy Fallon. I was like, ‘What is this?’ My blood pressure went through the roof, and I opened the email and it was [a picture of] the pregnancy stick. Stefani and Meyers discuss her new baby and a visit from Michelle Obama on Late Night with Seth Meyers. They are screaming and crying on the carpet in front of her, it was chaos. Stefani accepts the ALS Ice Bucket Challenge and nominates Gavin Rossdale, Nicole Richie and Jessica Alba. I feel like it represents lyrically where I was at… am at, a lot. It’s interesting being the first single because it lyrically summarizes the past couple of years. Sefani and Rossdale welcome their third son. Rossdale and Stefani are expecting their third child together. Stefani announces that she is having another boy. Seacrest interviews Stefani during On Air With Ryan Seacrest and asks her how she remains creative. I get all my favorite people that I work with together for a creative day. We sit around with our art books and magazine tears and make collages to try to get a direction. Seacrest interviews Stefani during On Air With Ryan Seacrest about Miley Cyrus latest album. She was so cool. I love Miley. She looked hot (at iHeartRadio) too. I asked her about her record. I said ‘Are you making a ridiculously good record?’ because she better be! She said she loves it. So I’m excited to hear what she does. With this record, I kept waiting for the title to come, and everyone’s like ‘What’s it going to be?’ And up until the very last minute, we didn’t have anything. But I wasn’t worried about it; because it always appears at a certain point. Push and Shove the song was one of the tracks we were working on last … and we got so excited about that song, it just finally all came together, and it felt like the kind of song that was everything we’ve ever been, yet it was new and modern. The record had been such a journey, and so hard to actually finish, we really had to fight to get to the end … so it kind of rose to the top [as a title]; like ‘Yeah, that’s what this whole thing was.’ It just seemed to sum it all up. 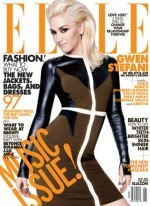 Stefani appears on the cover of the May 2011 issue of Elle magazine. Stefani gives birth to second son, Zuma Nesta Rock, with Rossdale. Kingston, Gwen and Gavin Rossdale welcomed the newest member of their family. Mother, baby and family are all happy and healthy. The artist releases, Early Winter, from, The Sweet Escape. I did this when Kingston (her child) was just 3 months old. I wanted a nostalgic number like Billy Idol’s Eyes Without A Face or Cyndi Lauper’s Time After Time. The artist releases, Now That You Got It, which features, Marley, from her album, The Sweet Escape. Tony was the first person I worked with after (her child) Kingston was born. There was a lot going on in my life emotionally at the time and I wanted to reflect that. The artist releases, The Sweet Escape, which features, Akon, from her album with the same name. The artist releases her song, Wind It Up, from, The Sweet Escape. The song uses a sample of “The Lonely Goatherd” from the musical, The Sound of Music. You can only do a song like this if you don’t care what people think. I grew up with that film and I cried when I heard the finished song. The artist releases her song, Crash, from, Love, Angel, Music, Baby. The artist releases her song Luxurious, featuring, Slim Thug from her album; Love, Angel, Music, Baby. The video for the song is the 9th one that is shot by Muller. The artist releases her song Cool, from; Love, Angel, Music, Baby. Stefani wrote the song with Austin. The artist releases her song Hollaback Girl, from; Love, Angel, Music, Baby. I did the whole record, but I knew I didn’t have my attitude song – my ‘this is my history, f–k you because you can’t erase it’ song. I knew I wanted a song like that. The artist releases, What You Waiting For?, from; Love, Angel, Music, Baby. Stefani marries Rossdale in London. After making a late entrance, Stefani walks down the aisle in a pink and white wedding dress by John Galliano. Rossdale wears a traditional British morning suit. Stefani and Eve wins the Grammy for Best Rap/Sung Collaboration for Let Me Blow Ya Mind.